Visit Operation Permafrost's icy world now. EVE Online’s latest update takes place around an ice dwarf. It’s a chilly wee rock like our good pal, Pluto. Operation Permafrost is EVE’s holiday event and, in typical EVE fashion, involves taking on a job from a mysterious employer, fighting mercenaries, disrupting a company’s operations and taking part in corporate wars. It’s space—there’s no room for festive cheer. Players can do some work for a secret third party, visiting the polar region of an ice dwarf to disrupt ORE Frostline’s operations and fight with Mordu’s Legion. The update boasts some new visual enhancements, and you’ll be able to get a good look at them by flying closer to the surface of a planet and flitting around asteroids. If you want to participate in the event, you can do so via The Agency in the Neocom menu. You’ll get given challenges that, upon completion, reward Agency points that can be spent on new rewards like Permafrost skins, boosters, cerebral accelerators and blueprints for new modules. The war declaration system also got an update recently, and you’ll be able to experience these changes without participating in the holiday event. The war declaration overhaul will span multiple updates across the next few months, with the first, out now, introducing war eligibility. Alliances or corporations will need to be eligible before declaring war or having a war declared against them, a system that is tied to structure ownership. 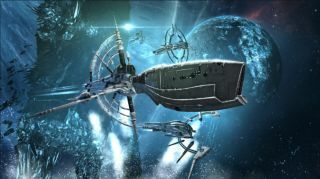 CCP hopes the changes will make corporations in high-security space safer because they’ll only be in danger from war if they’ve constructed specific buildings in space. Check out the war declaration blog post. EVE's also been dolling out free login rewards this month, which ends on December 28. Just hopping into the game will net you free stuff, while upgrading from Alpha to Omega membership will unlock even more. You’ll be able to work for your mysterious benefactor and unlock limited-time rewards through January 2.